Though 102 km east of Melbourne, Warragul’s growth has always been closely tied to the state capital. The railway link in 1878 saw the township thrive, with its sawmills supplying Melbourne with wood for building. Dairying soon followed, and remains the region’s most important export, with higher yields than to be had in many other parts of Australia. One and a half hours to Melbourne by train, it is beyond comfortable commuting distance, so its population continues to grow modestly. Warragul is a provincial town in West Gippsland. 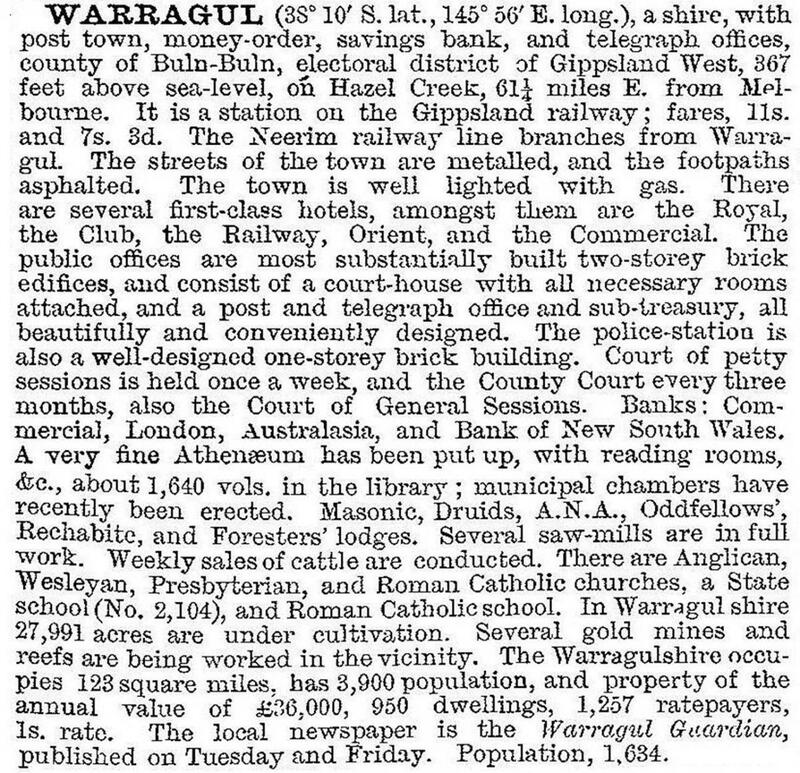 According to Bunce's Language of the Aborigines of the Colony of Victoria (1859) Warragul is an Aboriginal word meaning ferocious or wild. The area was densely forested with swamps to the east and west. It was 1845 before a track was cut from Melbourne to Gippsland, skirting north of the swampy land. From 1867, a coach service operated on a more southerly route, now known as Old Sale Road. One of the staging posts was at Brandy Creek, about 9 km north of present Warragul. Brandy Creek was supposedly named after Squatter William Pearson threw a brandy bottle into the creek. A small township grew up there, with a post office, hotels, churches, banks, stores and houses. From the early 1870s land was surveyed for selection around and south of Brandy Creek, and the township became the supply point for the selectors. However, the railway from Melbourne into Gippsland was surveyed to the south of Brandy Creek. A track was cut from Brandy Creek to the rail route, but once the line opened in 1878 the new township round the station rapidly eclipsed Brandy Creek which went into decline. By the next year, Warragul boasted four hotels, two general stores, a baker, butchers, blacksmiths, a shoemaker and a chemist. From the 1880s there were numerous sawmills in the Warragul district, cutting sleepers, building timber, paving blocks, barrel staves, fence rails, shingles, palings and firewood. Wooden tramways radiated from the station for the transport of the timber. Warragul station was the halfway stop between Melbourne and Sale. With refreshment rooms and more railway staff it soon predominated over the neighbouring railway towns. A branch line was also laid from Warragul to Rokeby, to the north, in 1890, reaching Neerim South in 1892. As the land was cleared of timber dairying became the main farming activity. The first butter factory was established south of Warragul in 1888. Some orchards, mainly apples, were planted and flax was grown during both World Wars. Some secondary industry also developed in the town. There was a cordial factory, linseed oil mill, brickworks and carriage makers in the early days. The butter factory in Warragul eventually produced mainly instant powdered milk. (Dairy processing is now centred at Darnum Park). From the 1940s some clothing and textile manufacturers and a rope and twine factory were established, as well as general engineering and metal works. Several saleyards operated over the years, until in 1939 the shire rebuilt yards immediately south of the railway line. On sale day, Thursdays, a produce market also operated. An agricultural show had been run since 1885, and in the 1950s annual dairy festivals were also held. In the early 1960s the first Gippsland Field Day was held near Warragul. Now staged at nearby Lardner, Farm World attracts thousands of visitors to its agricultural exhibits. The town grew steadily after World War II and growth continued into the new century. It is the centre for commercial, medical, educational and cultural activities in the region. The West Gippsland Hospital is supported by many specialist services. There are two State primary schools (1878, 1954), a State secondary college that began as an Agricultural High School in 1991, Catholic primary and secondary schools and an Anglican grammar school (1982). Warragul has a Gipps TAFE campus and campuses of the National Centre for Dairy Education and Education Centre Gippsland. The town has an arts centre and houses the headquarters of the Regional Library Service. The attractive residential areas are sited on rolling hills, while some rural residential lots have developed around the outskirts of the town. Dairying remains the major agricultural pursuit, the district supplying much of Melbourne’s whole milk. Beef cattle are also grazed and apples, potatoes, flowers, poultry and eggs are produced. A considerable part of the light industry in the town supports the farming sector, but textiles, greeting cards and furniture are also manufactured. The importance of the railway station has gradually declined. The electric train services introduced in the 1950s were replaced by diesel in the 1970s. Heavy road traffic has bypassed the town since a freeway was completed in the early 1990s. Train frequencies in morning and evening peak periods are 30 to 40 minutes for commuter workers to Dandenong or Melbourne. A life-size bronze statue of Australian boxer Lionel Rose was unveiled in Queen Street Park Warragul, in 2010. Rose was the first Aboriginal Australian to win a world boxing title. The former bantamweight world boxing champion was born at Jacksons Track near Warragul and fought many of his early fights in Gippsland. He died in 2011. In 2013 Victoria’s state planning minister released a planning blueprint that signaled population and employment growth in rural towns including Warragul. Warragul was ranked as the fifth most livable regional area in Australia for families in 2014 by real estate valuation company RP Data who ranked suburbs and towns based on factors including affordable home prices, block sizes and proximity to schools.